Through nostalgia’s filmy lens, old souls still idealize the state tournament for the little-bitty schools being played 16 teams strong in the musty Coliseum, where boots – cowboy, logging and snow – still outnumbered Nikes shuffling through the concourse, and Mansfield and its enrollment of 20 still took on Reardan and its 150 with no second thoughts. The good old days. Well, except for the part about the girls being marooned in a gym across town until Saturday’s trophy games. This was the small-ball world when Mike Colbrese took on the job as executive director of the Washington Interscholastic Activities Association 25 years ago. Lots of things were simpler then, for schools big and little. So accelerated is the evolution of marshaling high school sports now that when he exits in August, it may be from centrifugal force as much as retirement. Contraction and re-expansion of the state tournament fields. The RPI. Cross-state “regionals.” And coming up: a major overhaul of the classification criteria – back to hard caps, but now with the component of a school’s free-and-reduced lunch numbers. All the while trying to find a balance between two bottom lines: the fiscal and the emotional. 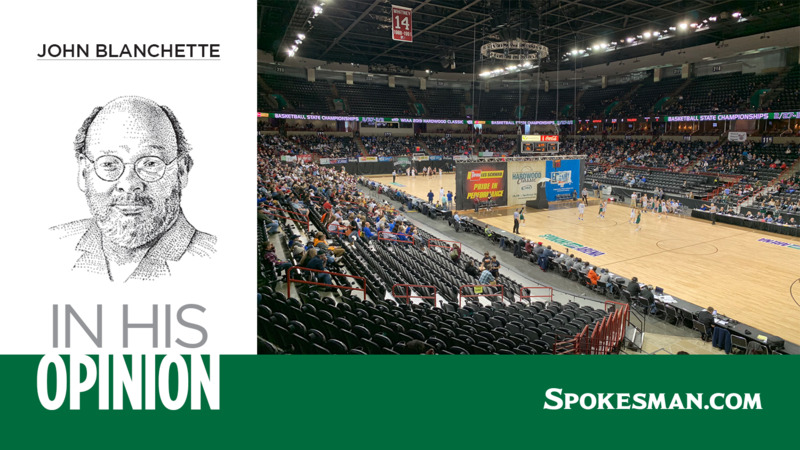 Nowhere is that fiscal/emotional tug-of-war more contentious than in the construct of state basketball tournaments like the small-school edition of the Hardwood Classic this weekend in Spokane. It’s been eight years since the WIAA membership whacked the state fields from 16 to eight teams at the sites in Spokane, Tacoma and Yakima, saving the staging costs of a fourth day. Outrage from the state’s coaches ensued and a little activism from some member schools led to a compromise three years ago – 12-team brackets, and a return to Wednesday starts. The bad news: Last March, revenues dropped a whopping $150,000 from the three sites – and expenses shot up $40,000. “That’s a significant hit,” Colbrese said, “especially when state tournament revenue is about 60 percent of the budget. If we don’t make that in the budget like we need to, then service fees or ticket prices have to go up. Other than recruiting – which the WIAA has no charter to govern or investigate – access to state is the organization’s forever hot-button issue. Which is why it was so encouraging to see the membership take a simple do-the-right-thing approach of factoring socioeconomics into the classification math. In short, a school can adjust its enrollment figure downward if it’s 10 percent or more above the average for free-and-reduced lunch students – 43 percent statewide. The WIAA amendment capped the decrease at 40 percent. The impact may not be as dramatic as it seems – Colbrese said he’d been told it might affect as few as 26 of the WIAA’s nearly 400 schools. But it’s obviously a boost to the schools that are affected, even if it might have some spin-off issues. Colbrese came to Washington after working in Montana’s high school association, and the immediate difference he noticed was a subtle one. “Washington, in my mind, is a very league-driven state,” he said. “In other places, you might have the Western A or the Northeast C. Here it’s the Greater Spokane League. The South Puget Sound. Leagues have names and identities, and they’re proud of their histories and traditions. And when you start trying to change things too much, you damage the league culture. Then again, the evolution is doing nothing but picking up speed. Published: March 1, 2019, 10:48 p.m. Updated: March 1, 2019, 11:06 p.m.